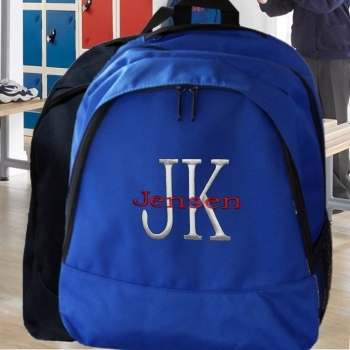 Personalised royal blue backpack or rucksack with initials or name embroidered on front. Superb 18 litre unisex backpack that is ideal for school, gym or sporting acitivities. Made from polyester canvas with large zipped main compartment, split into internal organising sections and a front zip compartment. Superb 18 litre unisex backpack that is ideal for school, gym or sporting acitivities. Made from polyester canvas with large zipped main compartment, split into internal organising sections and a front zip compartment. There is also a mesh water bottle carrier to the side. This sturdy backpack is ideal for school, sports, trips and sleepovers. Strong construction to protect the contents and comfy grip handle to the top for easy carrying and padded shoudler straps and backing for comfort. iPod and MP3 player compatible as this back pack includes a top carry compartment for the device and headphone port to allow minimal headphone wiring exposure. Personalised to order in your choice of thread colours and font style. Please fill in the options with initials or a name or both. We can sew most logos at special request. If you have any queries please contact us.